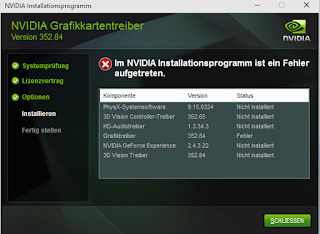 NVIDIA Driver cannot be installed on Windows 10 ? I had a huge problem installing/updating my NVIDIA Drivers using Windows 10. I tried everything, installation with ms device manager, Display Driver Uninstaller (DDU), and so on, nothing worked. Then an Microsoft Windows Update installed the driver, but an old version, so I tried to update it and had the same problem again. Now MS Update gave me error 0x80246007 for this driver. Device Manager shows "Microsoft Basic Display Adapter" instead of Geforce GTX780.